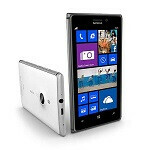 Nokia’s Lumia 925 is already making the rounds in Europe, and can be had in three colors, white, black and grey. UK retailer Clove has noted that it will have the grey model in stock by July 12th. Meanwhile, folks in Australia can expect to see the Lumia 925 available with major retailers beginning July 17th, which is also when it is expected to go on sale in the US with T-Mobile. Telstra will have the Lumia 925 on July 30th and Optus will begin selling it on August 1st for AUS $699. While Nokia’s July 11th announcement will shine the spot light on the AT&T exclusive “Elvis” (also known as EOS, Lumia 1020 or 909), the Lumia 925 is distinct for its six-element lens. If you are a Nokia fan and thinking of picking up a Lumia 925, check out our review Nokia’s newest flag ship device.